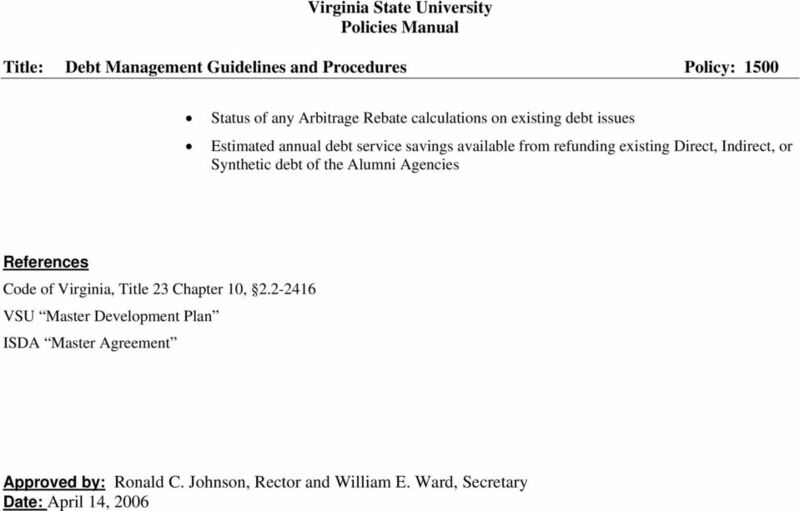 Download "Virginia State University Policies Manual. Title: Debt Management Guidelines and Procedures Policy: 1500"
2 other documents required for the issuance of securities, conducts validation proceedings and supports the issuer in the event of litigation. c. Capitalized Interest A portion of the proceeds of an issue set aside to pay interest on the securities for a specified period of time. Interest is commonly capitalized for the construction period of a revenue-producing project. d. Capital Lease Shall have the same meaning as the term is defined in the Commonwealth Accounting Policy and Procedures (CAPP) Manual. e. Call/Redemption A transaction in which the issuer returns the principal amount represented by an outstanding security (plus, in some cases, an additional amount or premium ). Redemption can be made at maturity of the security, as a result of the issuer s call of the securities prior to their stated maturity date, or in the case of variable rate debt, as a result of the security holder s election to exercise a put or tender option privilege. f. Call Provisions The terms of the bond contract giving the issuer the right, or requiring the issuer to redeem or call all or a portion of an outstanding issue of bonds prior to their stated dates of maturity at a specified price, usually at or above par and stated as a percentage of the principal amount called. g. Debt Service Reserve Fund The fund in which moneys are placed which may be used to pay debt service if pledged revenues are insufficient to satisfy the debt service requirements. May be funded with bond proceeds, or it may only be partly funded at issuance and reach its full funding requirement over time. If allowed in the bond documents, a surety policy from a bond insurance company or other qualified provider may be used to satisfy the Debt Service Reserve requirement. h. Direct Debt Direct obligation of University incurred to fund Capital Projects reduced by the amount of Direct Debt whose agreed upon repayment source is from the University Foundations. i. Financial Advisor A consultant who advises the issuer on matters pertinent to the issue, such as structure, timing, marketing, fairness of pricing, terms and bond ratings. j. 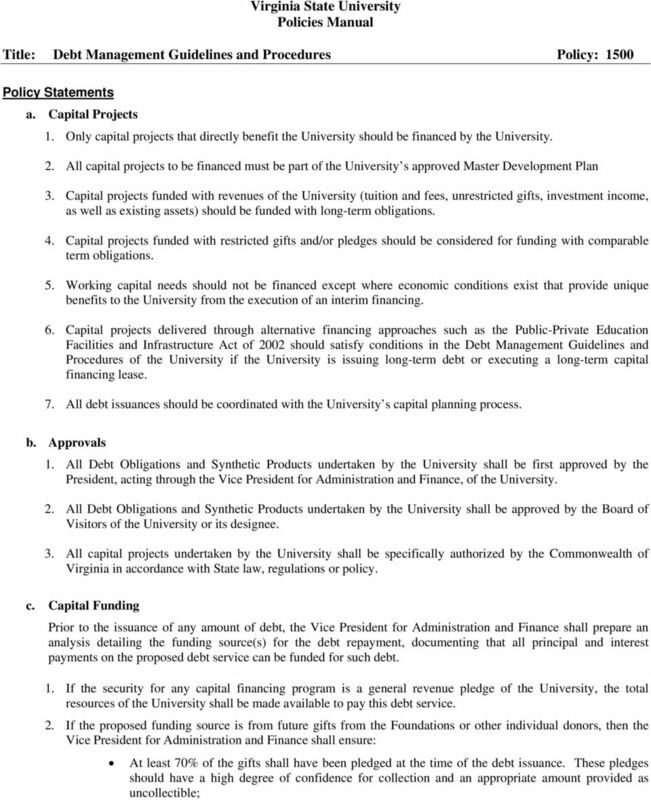 General Revenue Pledge Bonds or other obligations secured by the general operating revenues (rather than specific project revenues) of an institution of higher education. General operating revenues may include total gross university sponsored overhead, unrestricted endowment income, tuition and fees, indirect cost recoveries, auxiliary enterprise revenues, general fund appropriations and other revenues not required by law to be utilized for another purpose. k. Gross Funding Issuing the entire amount of the bond authorization with the intent to use any earnings on proceeds to pay additional project costs. Contrast with Net Funding. 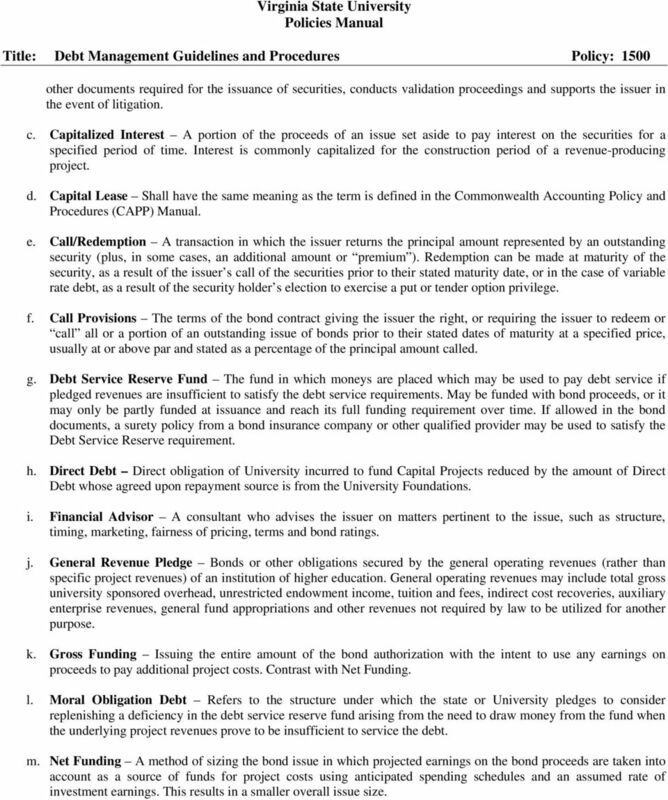 l. Moral Obligation Debt Refers to the structure under which the state or University pledges to consider replenishing a deficiency in the debt service reserve fund arising from the need to draw money from the fund when the underlying project revenues prove to be insufficient to service the debt. m. Net Funding A method of sizing the bond issue in which projected earnings on the bond proceeds are taken into account as a source of funds for project costs using anticipated spending schedules and an assumed rate of investment earnings. This results in a smaller overall issue size. 3 n. Present Value The value at the current time of a cash payment or stream of payments which is expected to be received in the future, allowing for the fact that an amount received today could be invested to earn interest until the future date(s). o. Present Value Savings A method of calculating the aggregate amount of savings on a refunding transaction. In each semi-annual period, the present value of the debt service on the Refunding Bonds is subtracted from the present value of the debt service on the refunded Bonds using the arbitrage yield on the refunding bonds as the discount rate. The present value savings in each year are added together to result in the aggregate Present Value Savings. p. Present Value Savings Percentage The Present Value Savings divided by the principal amount of the Refunded Bonds. q. Refunding A procedure whereby an issuer refinances outstanding bonds by issuing new bonds. Bonds are usually refunded to either reduce the issuer s interest costs or to remove a burdensome or restrictive covenant imposed by the legal terms of the bonds being refinanced. The new bonds are called the refunding bonds, while the bonds being refinanced are called the refunded bonds. An Advance Refunding is a type of refunding where outstanding securities are refinanced by the proceeds of a new issue of securities more than 90 days prior to the date on which the outstanding securities become due or are callable. The proceeds of the new securities are deposited in escrow and invested in U.S. Government or federal agency securities, with principal and interest on the escrowed securities used to pay principal and interest on the refunded bonds up to and including the Redemption or Call. 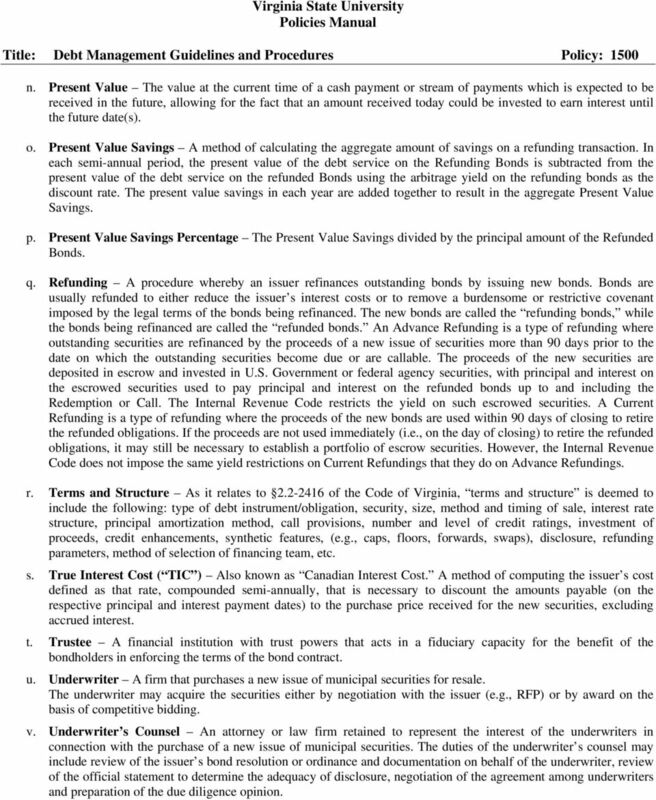 The Internal Revenue Code restricts the yield on such escrowed securities. A Current Refunding is a type of refunding where the proceeds of the new bonds are used within 90 days of closing to retire the refunded obligations. If the proceeds are not used immediately (i.e., on the day of closing) to retire the refunded obligations, it may still be necessary to establish a portfolio of escrow securities. However, the Internal Revenue Code does not impose the same yield restrictions on Current Refundings that they do on Advance Refundings. r. Terms and Structure As it relates to of the Code of Virginia, terms and structure is deemed to include the following: type of debt instrument/obligation, security, size, method and timing of sale, interest rate structure, principal amortization method, call provisions, number and level of credit ratings, investment of proceeds, credit enhancements, synthetic features, (e.g., caps, floors, forwards, swaps), disclosure, refunding parameters, method of selection of financing team, etc. s. True Interest Cost ( TIC ) Also known as Canadian Interest Cost. A method of computing the issuer s cost defined as that rate, compounded semi-annually, that is necessary to discount the amounts payable (on the respective principal and interest payment dates) to the purchase price received for the new securities, excluding accrued interest. t. Trustee A financial institution with trust powers that acts in a fiduciary capacity for the benefit of the bondholders in enforcing the terms of the bond contract. u. Underwriter A firm that purchases a new issue of municipal securities for resale. The underwriter may acquire the securities either by negotiation with the issuer (e.g., RFP) or by award on the basis of competitive bidding. v. Underwriter s Counsel An attorney or law firm retained to represent the interest of the underwriters in connection with the purchase of a new issue of municipal securities. The duties of the underwriter s counsel may include review of the issuer s bond resolution or ordinance and documentation on behalf of the underwriter, review of the official statement to determine the adequacy of disclosure, negotiation of the agreement among underwriters and preparation of the due diligence opinion. 6 Tax-Exempt or Taxable Financing 5. The average life of the indebtedness should not be greater than the average economic life of the asset being financed. 6. The debt should be amortized over the useful life of the assets financed; however, in no case shall the final maturity of the debt be in excess of 25 years without the expressed approval of the Board of Visitors. 7. The use of capitalized interest should be minimized whenever possible. 8. Debt should amortize in an expedited manner with a goal of 50% of the debt being amortized within the first 15 years. 9. Debt Service Reserve Fund s should be considered to enhance the security of the debt issue. 10. Debt should be structured in a manner that allows the coordination of borrowings and minimizes the effect of negative arbitrage on the borrowings. 11. 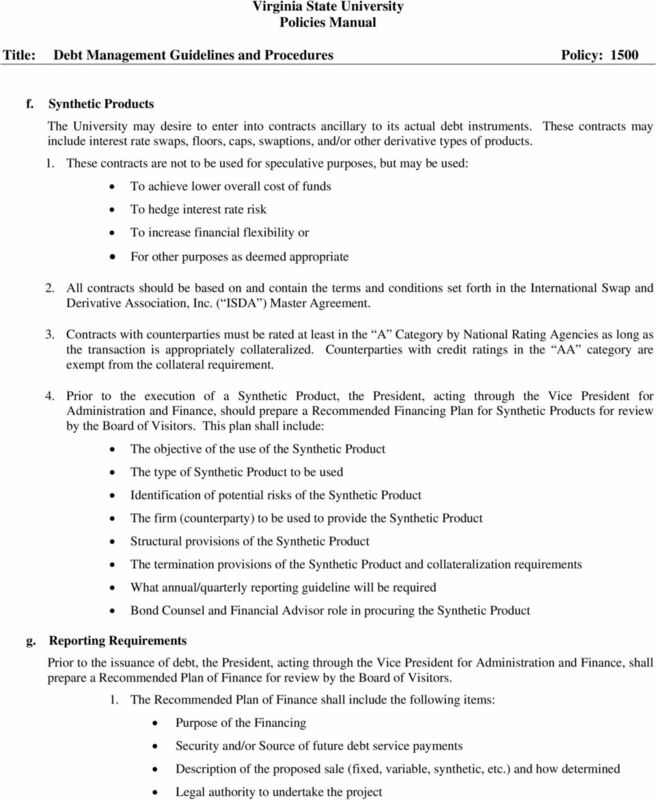 The following ratios should be maintained based on the proposed financing: e. Refinancing Obligations Unrestricted Net Assets shall equal at least 25% of the University Direct Debt. Maximum Annual Debt Service Costs as a percentage of total Operating Expenses shall not exceed 7% for non-revenue producing capital projects. The debt burden ratio may exceed 7% in instances involving debt of revenue producing capital projects when such obligations are secured by income associated with the project. The University should endeavor to keep track of its existing indebtedness (Direct, Indirect, or Synthetic) in an effort to reduce the annual debt service costs to the University. 1. For any debt obligations refunded to provide annual debt service savings, the following net present value savings thresholds shall generally apply: 5% if call date is more than 5 years form the date of the refunding; 3% if call date is within 5 years from the date of the refunding; 2. The final maturity on any Refunding Bonds should not generally exceed the final maturity on the refunded bonds. 3. 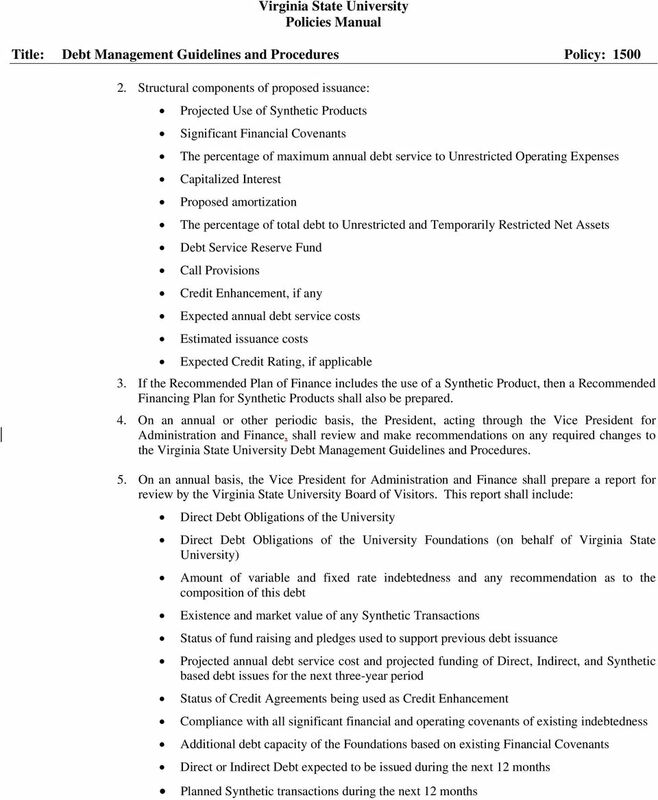 Refundings executed to provide relief from burdensome financial covenants or reduced annual debt service cost shall be approved by the Virginia State University Board of Visitors. 4. 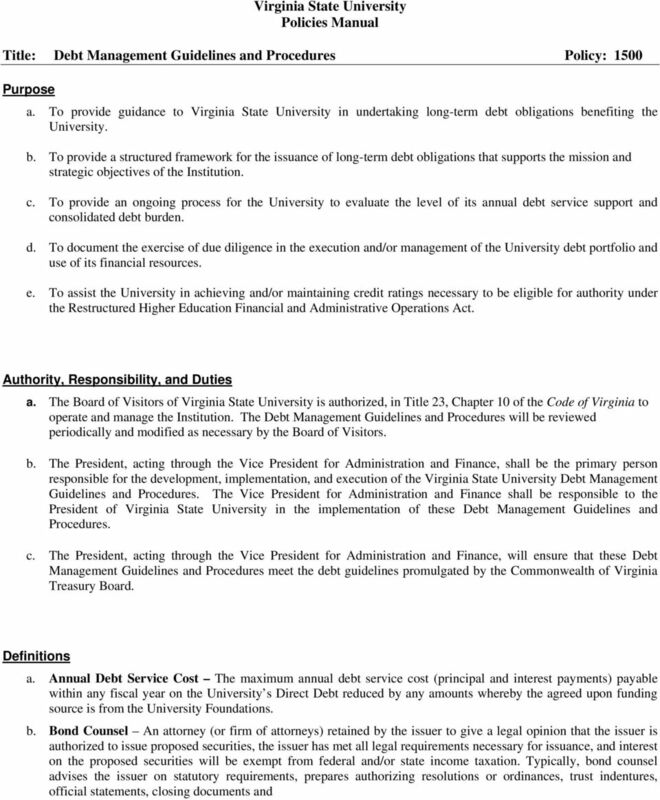 For Refunding Bonds, the University will seek to achieve approximate level annual debt service savings compared to the Refunded Bonds.